Double weave baskets start at the bottom, are woven up to the rim and back down again. This basket kit has brown reed trim on the side. 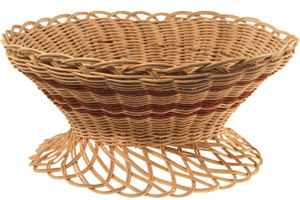 Basket pattern with #3 round reed in natural and smoked brown. Twining & plainweave with easy trellis border. 13" diam, 12" tall. Adult Medium Skill Level.